NLRB: Boeing Not Shut Out of S.C. Hysteria over an NLRB ruling on Boeing's South Carolina 787 plant obscures the ruling's limited scope. EVERETT, Wash. ( TheStreet) -- Despite the partisan hysteria surrounding a simmering dispute with Boeing ( BA - Get Report), the National Labor Relations Board's general counsel maintains the aircraft maker could address the agency's concerns and still build 787s in South Carolina. NLRB spokeswoman Nancy Cleeland said Boeing could simply agree to build 10 Boeing 787s a month in its Everett factory. Boeing had planned to build seven a month in Everett and three a month in North Charleston, S.C. In a ruling issued April 20, the NLRB counsel said that Boeing retaliated illegally against the International Association of Machinists by deciding to build a plant in South Carolina. "We are not telling Boeing they can't build planes in South Carolina," Cleeland clarified, in an interview. "We are talking about one specific piece of work: three planes a month. If they keep those three planes a month in Washington, there is no problem." Beyond the ten planes, she said, Boeing could build whatever it wants in South Carolina. Cleeland said the hysteria ought to be tamped down because the ruling's implications are not as broad as opponents seem to believe. Still, Boeing spokesman Tim Healy said a restriction that applies to three aircraft is not acceptable because the company did nothing illegal. "They are saying 'Okay, we're not trying to shut you down in South Carolina -- just agree that you're guilty,'" he said. "But we disagree fundamentally." Boeing announced in 2007 that it would assemble seven 787s per month in Everett. Later, the company said it would create a second production line to assemble three additional planes a month. In October 2009, Boeing said the second line would be in Charleston. The violation, according to the NLRB, was that Boeing "executives cited the unionized employees' past strike activity and the possibility of strikes occurring sometime in the future as the overriding factors in deciding to locate the second line in the non-union facility." The NLRB investigated after the International Association of Machinists filed charges. Healy said the problem is that the NLRB "would need to prove anti-union animus in our statements." He added, "We conducted a long series of serious negotiations with the IAM about whether to put a second line in Everett. We couldn't get that done. The IAM wasn't able to meet the minimum requirements we had in terms of the length of an agreement and the economic terms of an agreement." Healy said not a single IAM member was harmed by Boeing's decision. "We've grown by 2,000 people in Everett since we announced we would put a second line in Charleston," he said. The April 20 ruling has a long way to go if it is to be upheld, starting with a June 14 hearing in Seattle, and could potentially end up before the U.S. Supreme Court. But, given the fierce competition between states for manufacturing jobs, the ruling has been seized upon by a myriad of opponents as an example of a government agency gone wild. The ruling was issued by NLRB General Counsel, Lafe Solomon, who has spent nearly 40 years on the NLRB staff. Named acting general counsel in 2010, his nomination to the post is currently pending before the U.S. Senate, where it now seems likely to incur significant opposition. Under NLRB procedure Solomon's staff will present his case to an administrative law judge at the Seattle hearing. If the judge's decision is appealed, the case would go to the full board. The board has four members, including three Democrats and one Republican; normally, the five-member board has three members from the U.S. president's party and two from the opposition. 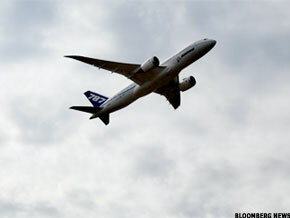 Boeing shares were up almost 75 cents in afternoon trading Wednesday at $77.25.